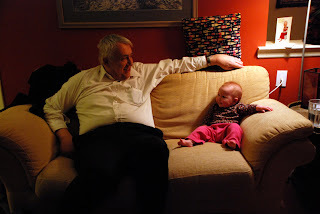 Zora tells it like it is: Grandpa, I know that you have Libertarian tendencies, but the center is really where it's at. The first thing I notice when I step into the shower is Rodney's latte sitting on the window sill. I look at him incredulously. He shrugs, "I figured that I could drink my coffee while you were rinsing." Just then Zora starts crying. Until we had a baby, I had no idea what an utter luxury a shower was. Time to read the shampoo bottle. Time to consider the soap scum patterns on the tiles. Now, I spend so little time bathing that my legs have become a veritable old growth forest of hair. "I'll stick a pacifier in her mouth," Rodney says heading out the door. 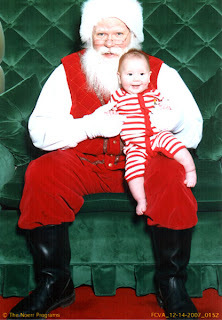 Seconds later the crying stops. Then it starts again. If I know my daughter, she's plucked the pacifier from her mouth is holding it in her chubby little paws. "I won't be silenced, thank you very much," her wail indicates. Next, I hear the first few bars of the Bach melody coming from her mobile. Zora counters with a defiant holler. Then, silence. A minute later, Rodney pulls the shower curtain open and steps into the shower with a diaper-clad Zora. She takes one look at my sudsy head, turns a startling shade of persimmon, and bursts into tears. 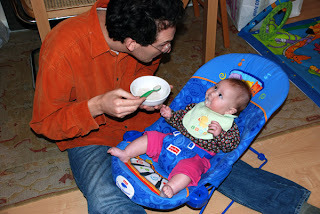 "I think she's hungry," R says leaving with our shrieking daughter. I finish my rinse cycle, and just as I'm stepping out of the shower, R returns with Z and a bottle of formula. I give him a cockeyed look. "Were you really planning on taking a shower with Zora while feeding her and drinking your latte?" I ask. His dark eyes widen and twinkle. "I thought it was doable," he says optimistically. Will: I know, I can't believe those are our parents. 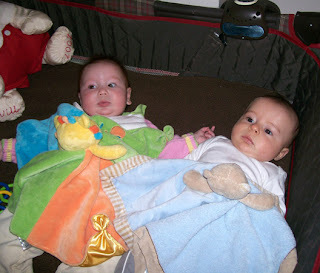 Yes, Zora and Will are only about five and four months old respectively, and they are already giving us The Look. And we thought we'd have to wait until they hit puberty before they became thoroughly embarrassed by us. In our defense, Zora and Will did look ridiculously cute hanging out in the bassinet, kind of like a heap of hamsters snoozing comfortably together--Will cooing and purring like a miniature Chewbacca (Tony and Jodi coined that one! ), Zora pumping her little legs and crowing to be picked up. Of course, Tony, Mauricia and I crowded around them snapping photos and squealing like the infant paparazzi we are. Who wouldn't?? 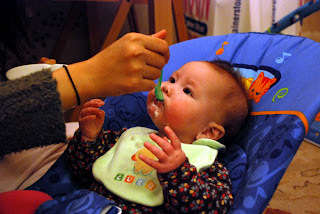 Z sampled rice cereal for the first time this Sunday, and what a revelation it was. "You mean there's more to life than just formula??" Z's eyes communicated with great incredulity. "Believe me, kid," Rodney told her spooning another glob of rice goop into her gaping, gummy maw, "it gets better." This is the song we sing when we find a poopy diaper. Wee Z as of late has discovered that her little hippo legs can propel her up and down. 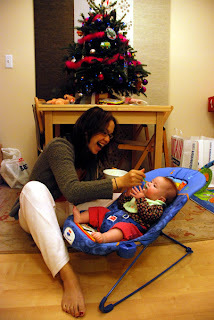 Once Mommy's arms--which are totally ripped now from holding Zora during many hours of jumping--gave out, Z requested a jumperoo to blow off that pent up baby energy.